No experience needed, all supplies provided, just bring your smile! Everything is supplied at our workshops. Bring your own scissors, if you would like, but all you really need is a smile! The workshops are fun and filled with chatter and laughter, so don’t be surprised if you make some new friends, too! Sisters: 1st and 3rd Tuesdays, Sisters City Hall, 1:00-2:30 p.m.
Bend: 2nd and 4th Thursdays, Rosie Bareis Center, 12:30-2:00 p.m.
Redmond: 2nd and 4th Fridays, Redmond Senior Center, 1:00-2:30 p.m. 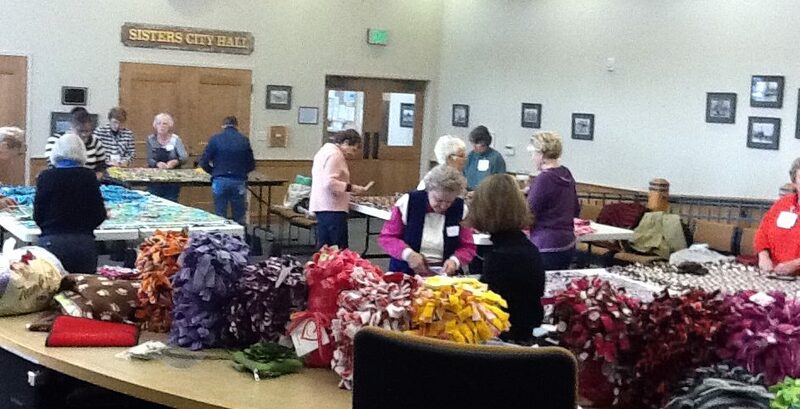 Volunteers and Blankets in Sisters City Hall.